A group of 6 girls from the district were flagged off for National Level Table Tennis Championship to be held at Gujarat on December 27 in Kargil. The championship will be held from January 3 to 7, 2018. 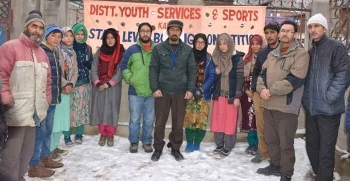 Flagging off the girls, Abdul Hadi, Assistant Director Planning, Kargil along with Muhammad Hussain Rehnuma, District Youth Services and Sports Officer Kargil, extended their best wishes and congratulated them for their selection for the National level games. Abdul Hadi, AD Planning said that there is no dearth of talent in Kargil but the need of the hour is to harness the potential of the youth in the right direction. He said that there are large numbers of talented sportsmen in the district who can make a mark at national and international levels. While speaking on the occasion, Muhammad Hussain Rehnuma, District Youth Services, and Sports Officer Kargil said that the Department of Youth Services and Sports Kargil is paying concerted focus for the back-up of sports activities in the district by way of encouraging young local players besides creating sports-related infrastructure, particularly in rural areas. The girl players selected for the National level championship include Asiya Fatima and Hakima Banoo in the Under 19 category, Mehroon Nissa and Nasreen Fatima in the Under 17 category while as Archo Syeda and Shabana Batool in the Under 14 category respectively.